Our 70 hectares grazes a herd of Angus cattle with a manager. There is a running creek, several dams, many kangaroos (maybe a koala)and bird songs to wake you each morning. 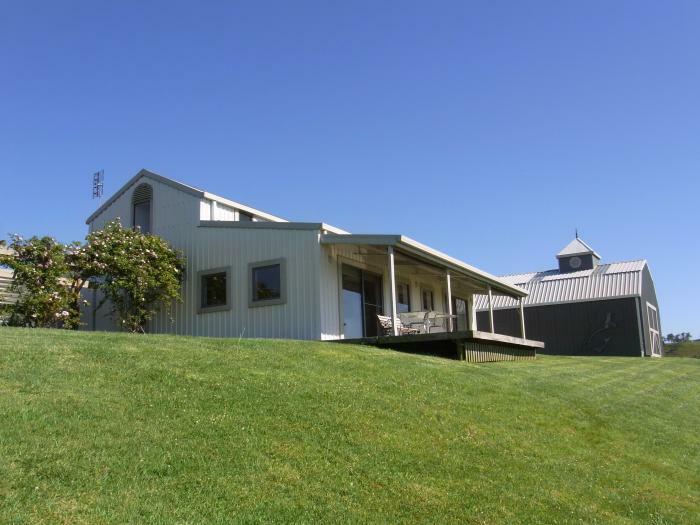 The hilltop house ('Mille Coteaux', a converted barn)up a 500m tree-lined driveway, has 115 sqm living+ 60 sqm patios. Main floor has queen bed, bath, dining, kitchen all opening to commanding Eastern views. Living room with folding glass wall opens Westwards to a patio with spectacular sunsets. A workshop adjoins, housing a beautiful Gypsy wagon, beloved of grandchildren. Upstairs is another queen bed, bathroom and living with 2 sleeper settees. All areas air conditioned with ceiling fans. Sleeps 6 in comfort - more if you use the wagon. Taree is a regional commercial centre on the Manning River,with all medical, financial and government facilities. Forster is a major beach holiday resort with all recreational, restaurant and commercial facilities. 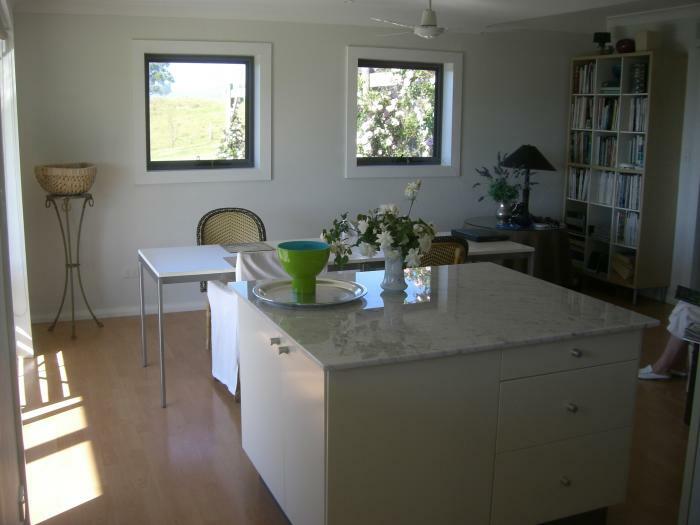 Bunyah is an old-established farming locality, 45 mins to wonderful Forster and Bluey's white sand beaches or to Taree city; 1.5 hours to famous Hunter Valley wineries or Barrington Tops nature reserve; less than 3 hours up the freeway from Sydney. 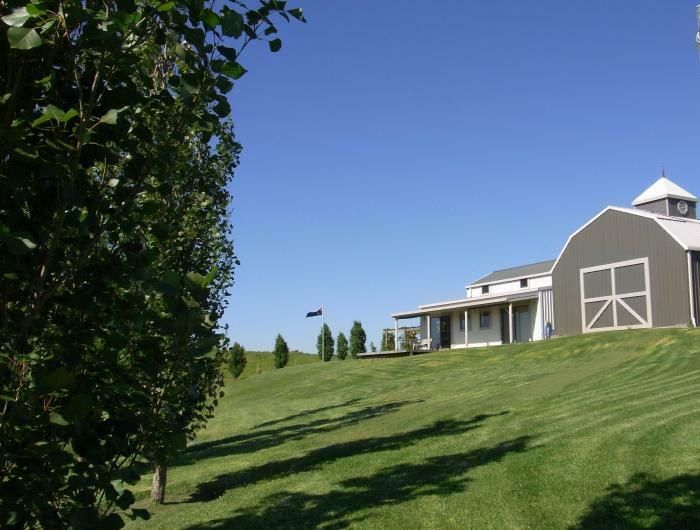 Beautiful farmland with 30 km views over rolling hills; amazing sunsets and starry nights. So quiet and relaxing - or so close to the action. You choose. About We are Peter and Ellenore, retired professionals with 6 children and 21 grandchildren (who don't travel with us. Phew!) Our farm, "Mille Coteaux" is our retirement folly - all the comforts of our Sydney harbour-front home, adapted for easy country living with freezers, bread makers, ice-cream maker and espresso machine etc. but with just enough farming to keep us fit. We've done a lot of travel round the world and are great Francophiles. Want to spend more time in France, experience more of everyday local life and improve our language skills. We want to travel in Spring or Autumn, away from the holiday crowds, preferably between April and November 2014.